At least 10 people have been killed and 20 others injured in a suicide attack on a busy market in the north-eastern city of Kunduz, officials say. The province's police chief said the head of counter-terrorism and the chief of traffic police were among the dead. 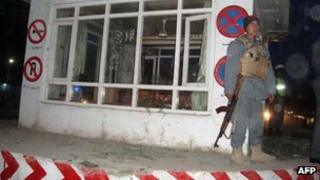 The attack took place at around 1720 local time (1250 GMT), a Kunduz police spokesman said. No-one has yet claimed responsibility but Taliban insurgents have been behind a string of similar attacks. The province's governor said the bomber was driving a motorbike and used potent explosives in the attack, which took place in the heart of the city. "Sadly I can confirm that the head of counter-terrorism and traffic police for Kunduz province have been killed in today's suicide attack in the centre of Kunduz province,'' police chief Gen Khalil Andarabi told the BBC. The counter-terrorism head, Mistaray Maray, was the man behind the killing and capture of dozens of Taliban commanders and leaders, says the BBC's Bilal Sarwary, in the Afghan capital, Kabul. The province is considered the most important province in the north for the Taliban as it represents a hub for further penetration into relatively peaceful areas, our correspondent says. Also on Saturday, a suicide attacker riding a bicycle killed two civilians in the country's south-eastern Ghazni province. On Friday, a suicide bomber in a car attacked a Nato convoy in the strategic Kapisa province, killing at least five civilians and wounding 15.